Our approach will integrate machine learning, information visualization and expert knowledge into one framework. When machine learning is combined with information visualization, it allows not only to understand the data, but also to understand how the algorithms have obtained their models and whether they are indeed a faithful representation of the underlying data characteristics. Thus jointly they can be used to understand the validity and potential of predictive models. Neither a fully automatic, nor a pure expert knowledge driven assessment is an answer to the challenging requirements of the FP field. Both play a complementary role in the assessment. 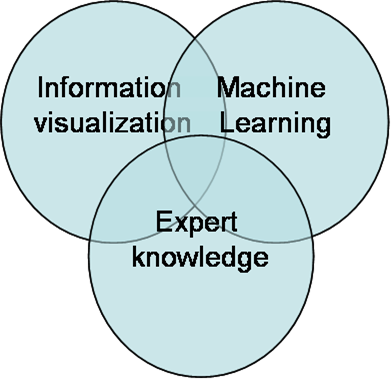 Ideally the strengths of expert and machine are combined. In such a system the machine learning algorithms do an initial analysis of the data which is visualized for the user in various ways to show different aspects of the model. The expert then assesses the quality of the model, indicates flaws and indicates new directions to explore. As the choices are made explicit the expert can iteratively create the best model, which can be completely justified and understood. As a first step in this direction we have developed a tool which can help in determining the tradefoff between false positives and false negatives which is directly coupled to the decision boundary corresponding to the model. Users can interactively change the operating point on the ROC curve to see its effect on the classification model. The Week 47 Forensic Science Geek of the Week is Announced!